Spring is the time of year when we honor teachers. They have dedicated another year to loving, teacher, and challenging our kids, and while no novelty check or plexiglass trophy can adequately thank them for that, we hope that they feel the love. I spend a lot of time writing about education policy now, but a couple of years ago I covered H-E-B Excellence in Education Awards, Trinity Prizes, a Miikan Award, and numerous district-level honors. Between employments I read grants for the SAISD Foundation innovation grants, which is an inside look at all the cool things teachers would do if they had the money. I’ve met a lot of really fabulous teachers, and heard a lot of really fabulous ideas. Of course, the most coveted award for any teacher should be the trust and gratitude of parents and kids, and most say that it is. Teachers who are moving children academically and emotionally toward independence are vital partners for families. I understand that better now that my own children have teachers who understand their strengths and weaknesses, and do the difficult work of knowing when to cushion and when to challenge. However, acknowledging those who are doing the “extras” serves to illustrate what’s possible when teachers have the support they need—whether from parents, community partners, or from their district. A lot of professionals have unique interests that can ignite their classrooms. I no longer write about other people’s awards, but I thought I’d take a moment to note three teachers who exemplify, to me, what’s possible when bright, ambitious teachers are free to pursue their professional passions inside and outside the classroom. Bonnie Anderson of Coronado Hills Elementary in Judson ISD saw her first marimba chorus in 2010, when Walt Hampton brought his students from Washington to perform their Zimbabwean repertoire at the Texas Music Educators Association. “I saw what his kids could do, and I was like I want my kids to do that,” Anderson told me. 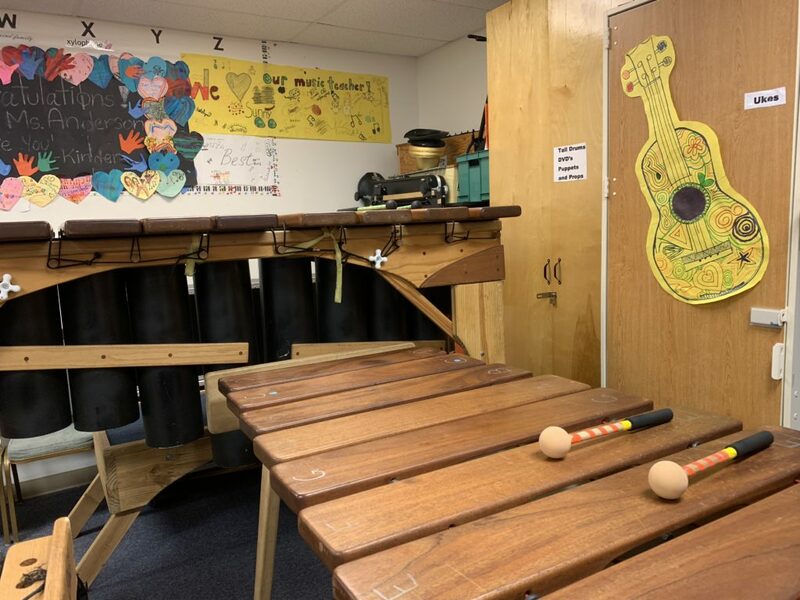 But to get the marimbas she needed was far outside her discretionary class budget, and none of Judson ISD’s approved vendors carried the special instruments. This could have been a story of buearacracy stifling creativity, but Anderson persisted. She fundraised several thousand dollars, she advocated, her students advocated, and the district got on board to the tune of $9,000. Getting involved in Mojo-rimba is as big of a commitment as any sport. Parents emerge as vital volunteers, and eventually set up a non-profit with the goal of getting the kids to Carnegie Hall. Students have fallen so deeply in love with the club that they campaigned to continue it into middle school, meeting once per week in the evening. Many of them, Anderson explained, had found the language that spoke to them. In 2018 H-E-B Excellence in Education Awards recognized Anderson with the Lifetime Achievement Award. One could see where it might be tempting for the district to try to spread Anderson—or her marimba collection—more thinly in the name of equality. And I’m usually a hound for such things. However, in this case, I think diluting the group, or Anderson’s focus, would be counterproductive. A chorus like this isn’t possible everywhere, but without teachers like Anderson, unafraid of bureaucracy and tons of extra work, it wouldn’t be possible anywhere. The report is full of incredibly useful information and recommendations for those who have more than a vague suspicion that part of what ails many of our children is not lack of technical proficiencies, but a lack of social wherewithal. It’s always thrilling to talk to people who approach their career with both hands. With one hand they do the day to day work and with the other they get at the big systems that need to change. Ozuna is doing that. She’s all about quality in her classroom, and she’s all about systems that can deliver that quality to more kids. This approach is rare in early childhood education and social emotional learning, both fields experts agree hold massive potential for our kids. Experts and educators agree on that and yet…our society treats both pre-k and SEL like cold-pressed juice, flossing, and physical therapy exercise. Things we know are incredibly beneficial but have limited enthusiasm to continue, or even to execute with fidelity. So to see someone really champion social-emotional learning for the littlest kids at a campus and national level, well that is notable. And her fellow teachers took notice. They were the ones who encouraged her to apply to the commission. Ozuna is a second generation member of the San Antonio Alliance, and said she felt incredibly supported by them in what will undoubtedly prove to be a solid career move. Katie Hodge of MacArthur High School in North East ISD is the last teacher who recently sort of blew my mind. Hodge is fairly early in her career. She’s been a high school English teacher for five years. She’s one of those young, inspiring millennials who went into teaching to make the world better. She also believes that to make the world better, you need to get out in it. Knowing that many of her students wouldn’t ever be able to do that on their own, Hodge decided to sponsored a high school trip to Italy. It was 23 high school students, three other adults, and her. Now, teachers have been doing this for decades, taking school groups to Europe. I’d always assumed that it had to be instigated and subsidized by their school district. That no one in their right mind would undertake the fundraising, paper chasing, and then teenager supervising of such a trip without the nudge and support of their boss…and their boss’s boss…and their boss’s boss’s boss. But that’s what she did, and that’s what so many teachers do when they want to give their kids something more than what’s on the menu in their district. They find a way to do it themselves. We hear about teachers buying supplies that aren’t within the budget, or can’t be obtained quickly enough from approved vendors. It ranges from crayons to marimbas to international travel. Hodge said she saw huge benefits for her kids, many of whom raised all the funds on their own, doing odd jobs, saving money from jobs they already had. Some parents pitched in, but some could not. Committing to the goal and seeing it through was great for the kids, Hodge said. She also asked them to reflect on their feelings as they traveled. Why were they so annoyed at certain things in Italy? How did it feel to not understand the people around them? When was it difficult to be flexible? As kids who live in the age of super personalization and digital interaction, that last bit was key, Hodge said. They rode a bus all over Italy, and only a few had international data plans on their cell phones, so she encouraged them to focus on being present. For most of the kids, the experience led to a shift in their worldview, Hodge said. I think that’s really the “extra” all teachers are going for when they deliver above and beyond. They want to change the way kids see the world, and how they see themselves in it. They want to move them from the center of their own universe, but to give them the language and tools to explore the universe from a place of security and confidence.